Today is the last day of school and I got the kids involved in creating a Job Wheel. Gibson created the wheel and Emma colored the pictures. I decided to have a daily job and a weekly job which will rotate every week. Some of the jobs like taking out the trash and watering the plants will be easy for the kids, but some of the other jobs will require training. I have to admit that I am a little worried about the laundry job. I have visions of all my long-sleeve shirts shrinking to my forearm, and don't get me started on what will happen the first time they wash a pair of pants with a half empty bag of skittles in the pocket. YIKES!!! Brad, found you through Jane Nelsen posting your blog on the Positive Discipline Facebook page. I'm following you now (blog and twitter)and am totally psyched to find another Positive Discipline parent. 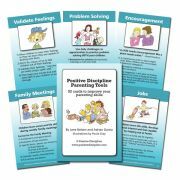 I try to write a parenting article a week (or so) on my blog (or as a guest blogger) to try to get the word out about this great parenting technique. 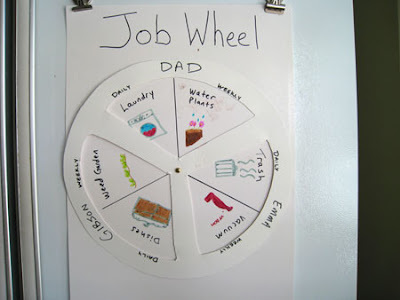 Love the chore chart! My little ones are still really young, but I'm fully prepared to start this in the next year or so as my oldest is starting help around the house. This is a great idea! I will have to make one of these!